It’s about time you got caught up with hoops. We get it, Oklahoma State is a football school (for now), so this is here for you if you’re behind on hoops because you’ve been too busy formulating how OSU’s football team is 6-6. I’ll get the basics out of the way up here. The Cowboys are 4-3 this season with losses to Charlotte, Villanova and Minnesota. 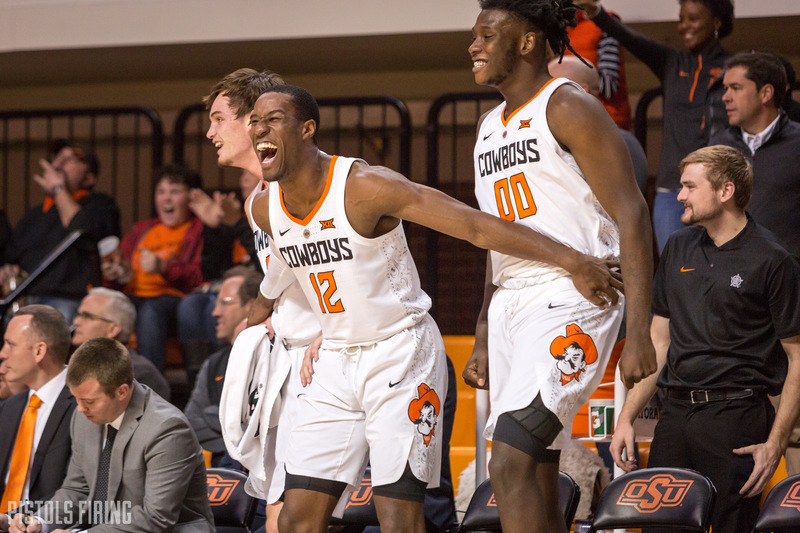 OSU took third in the AdvoCare Invitational in Orlando, where the Pokes picked up their most impressive victory this season, a 90-77 win against then-No. 19 LSU. The Cowboys blew a 24-point lead to Charlotte in the opening game of the season. That is odd enough, but that game’s conclusion is even more weird. Up 3 with 4.2 seconds left, the Cowboys chose to foul to prevent the 49ers from getting a 3-pointer off. So, Lindy Waters did so, and after video review the officials determined the foul was a flagrant, meaning Charlotte got two free throws and the ball. Jon Davis, Charlotte’s star player, made both free throws and a 3 at the buzzer to give the 49ers a 66-64 victory. This was made even more odd given the fact Charlotte intentionally fouled a few times to extend the game, but no flagrant fouls were called then. Weird stuff. In his second season as a head coach, Boynton is now up to four Top 100 recruits. All four members of Boynton’s 2019 class have signed, three are Top 100 recruits and the other is a twin of a Top 100 recruit, so you gotta think if one could do it so could the other. (Avery Anderson’s 247Sports Composite is outside of the Top 100, but his 247Sports ranking is 80). That class is ranked 15th in the country, but Boynton has already gotten started on his 2020 class when Davonte Davis committed to OSU on Sunday. Only 18 2020 commitments have been recorded by 247Sports, but Davis’ commitment has OSU sixth nationally for the time being. About 35 percent of the Cowboys’ made field goals this season have been 3-pointers. The Cowboys have shot 43.8 percent from deep, and four OSU players are shooting 50 percent or higher from 3. Thomas Dziagwa has made a team-high 24 3s on 55 percent shooting. Dziagwa, Lindy Waters and Cam McGriff, the team’s three captains, have made 49 combined 3s, and graduate transfer Mike Cunningham who missed OSU’s first three games with a hamstring injury, has hit 10 triples despite having played only 77 minutes this year. So all of that was to say, this team fancies itself a 3-ball. Here is a table of stats in which Cam McGriff leads OSU. At this time, it’s hard to tell whether McGriff is in fact human, just check out the side of his foot nearly touch his shinbone and him walk it off. Redshirt sophomore point guard Michael Weathers brought a lot of hype with him into this season, and, after serving his suspension, he has lived up to it. Weathers has scored in the double digits in four of the six games he has played in. He also shooting 51 percent from the field. Dustin Ragusa did some film review on his performance against Minnesota, but in summation, Weathers gets to the rim at will, and often draws help defense away from the 3-point line, which is a bonus for all of the Cowboys’ shooters. OSU has six freshmen on its roster who have combined for 536 minutes in the Cowboys first seven games. Two of OSU’s freshman have also started each of the team’s games. Isaac Likekele, a point guard, has started all seven, Yor Anei, a center, has started four and Duncan Demuth, a forward, has three starts. Likekele has been the most impressive of the freshman class. He’s averaging about 8 points a game and has a team-high 30 assists this season. Against LSU in the AdvoCare Invitational, Likekele flirted with a triple-double, finishing with 9 points, 9 rebounds and 8 assists. Yor Anei already has 19 blocks this season. Anei’s 2.71 blocks per game ranks 17th in the country and is fourth among freshmen. Against Memphis, Anei blocked six shots, tying OSU’s freshman record.